Macaroon Blossom Cookies are the perfect marriage of coconut macaroons and blossom cookies! 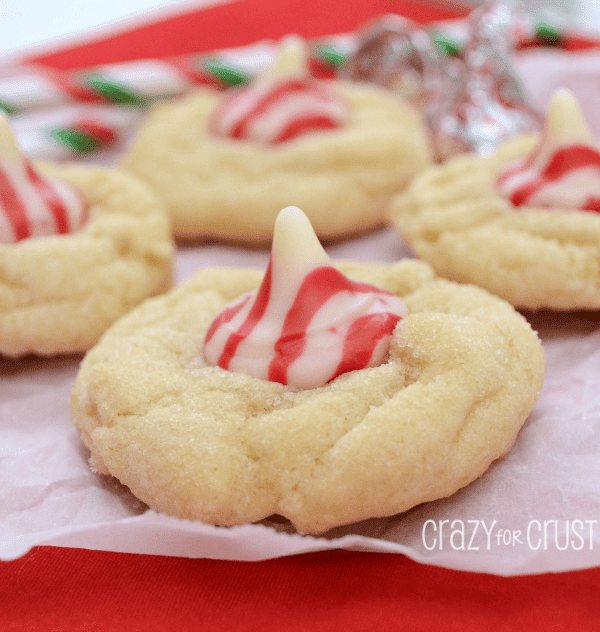 This is an easy, fast holiday cookie recipe that’s also egg-free and can be made gluten free! I’m mad at Amazon Prime. One, they steal all my money. And two, they teased me with Veep. Recently, Mel took Jordan to visit his family in San Diego. I got to stay home, drink martinis, and binge watch television shows. I’d started season one of Veep, that HBO show with Julia Louis-Dreyfus. They let you watch HBO on Amazon Prime, so I was excited to watch the bulk of several seasons. And then I finished season one and the rest required payment. WTH Amazon Prime??? That’s just not nice, not nice at all. It took me about 24 hours of searching, but I finally found another show to binge, one I liked even more: Girlfriends’ Guide to Divorce. It’s a Bravo show that you can binge watch on Netflix (so there, Amazon!) and I loved it so much I watched 13 episodes in 24 hours. !!! While I was watching all the television, I also ate all the cookies. I know, it’s a problem. 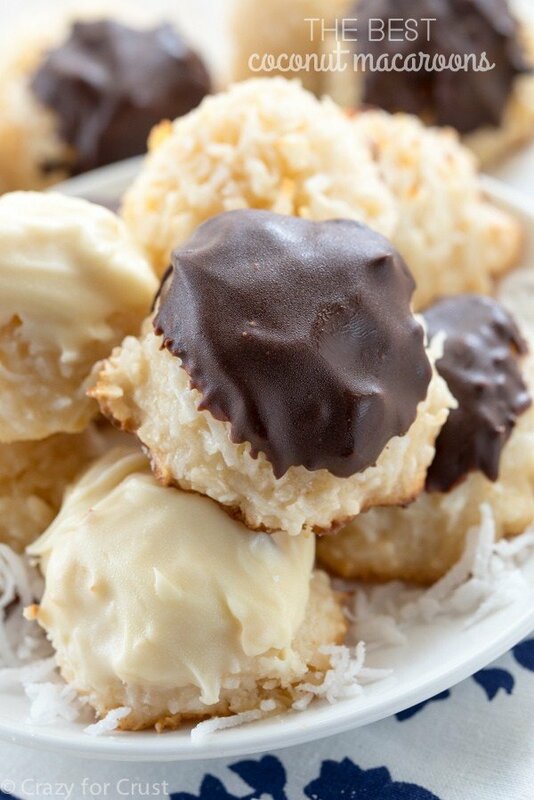 Coconut Macaroons are some of my favorite cookies. Are they yours? How about Coconut Macaroons with Hershey’s Kisses? I love a good blossom cookie this time of year (well, all year, but especially at Christmas) and I thought, why not combine the two? Enter: the greatest idea ever. One of my favorite things about my Coconut Macaroons recipe is that they are egg free. I searched for a long time for a macaroon recipe that would yield a thick bakery style cookie. After trying them with and without eggs, I discovered I liked them egg-free better. I also discovered that I like them with flour better than without. The problem with putting flour in macaroons is that, when you make them without flour, they’re gluten free. This recipe, made with all purpose flour, is not. BUT…these? These are made gluten free, with my regular recipe! I’ve been experimenting more with GF recipes, and I’ve been using a Gluten Free 1:1 All Purpose Flour with huge success. So, if you’re looking for a macaroon recipe that tastes like a bakery style macaroon but is also gluten free, you can make these either way. So, let’s review: Dorothy’s Coconut Macaroon Blossoms can be made with regular flour and be egg-free. Or they can be made with gluten free flour and be gluten free and egg free. 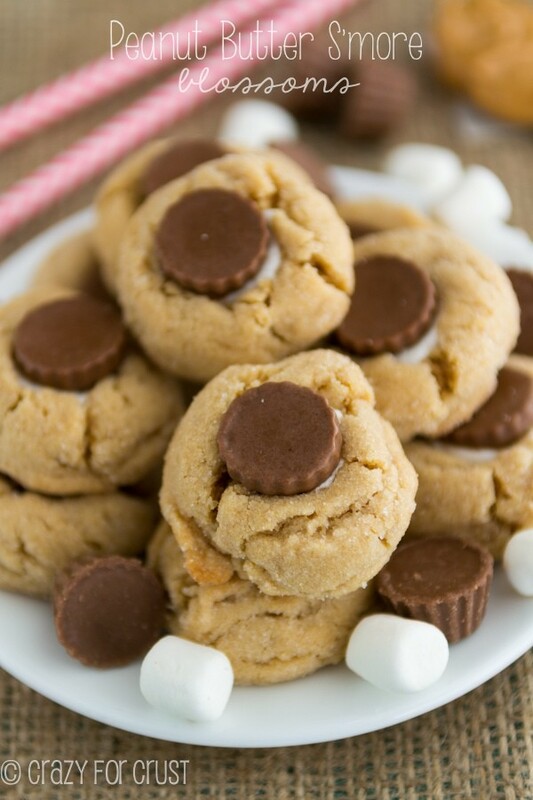 That makes them a great allergy friendly holiday cookie recipe for those with allergies! Also, they’re blossoms, and blossom cookies are pretty much required at the holidays! The cookies are scooped with a 1 tablespoon sized cookie scoop, and the recipe makes about 60. If you want a bigger cookie, you can make them bigger and get less, but baking time will be affected. 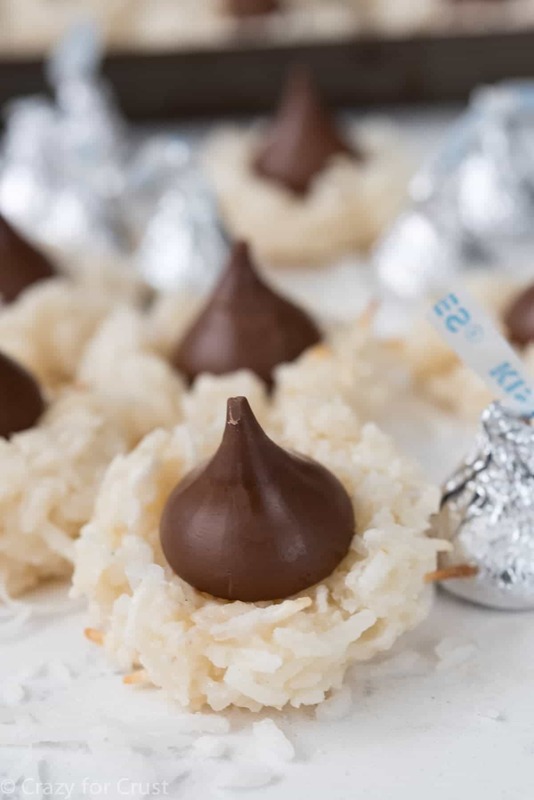 As you can see from the photos, the Hershey’s Kiss doesn’t get swallowed into the blossom like a normal cookie because these are macaroons, not regular cookies. But they will melt to the macaroon and stay secure. Easy Macaroon Blossom Cookies - this recipe is fast and full of coconut flavor! 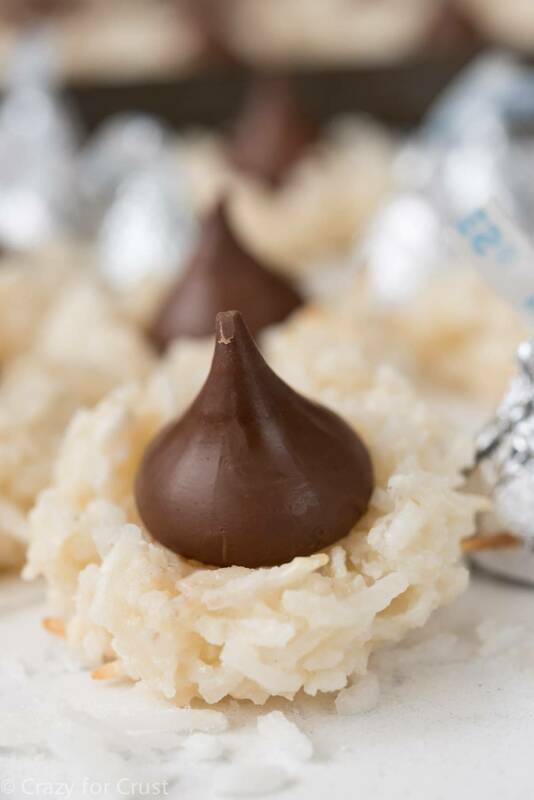 Easy egg free coconut macaroons are topped with Hershey's Kisses. These are the perfect cookies for all year long, and they can be made gluten free. Preheat oven to 350°F. Line cookie sheets with parchment paper or silpat baking mats. Stir flour, coconut, and salt. Stir in sweetened condensed milk and both extracts. Stir until combined. Drop 1 tablespoon balls of dough onto the prepared cookie sheets. These do not spread so you can crowd them close together. Wet your hands slightly and push down any sticking up or out single pieces of coconut as these might burn. Bake for about 8-11 minutes, until the bottoms are golden and the tops start to turn the tiniest bit golden. Immediately press a Hershey Kiss into the center. (Note: the Kiss won’t sink down into the macaroon like in a normal blossom cookie but they’ll melt to the top and stick.) Let the Kisses harden back up before moving the cookies off the cookie sheet. I’m a coconut fiend and I’m all about these macaroon blossoms! Hahahaha…I know, so annoying! These look really good! Great idea! What a brilliant idea!! I love these two combined! Brilliant! These look incredible, pinned! I feel the same way about Amazon Prime. I don’t have cable or satellite, so I rely on Amazon to entertain me. It peeves me when I like a show, only to be left hanging after the first season!! Yummy cookies and TV: sounds like a fun way to spend some time :). These look yummy! I love that you combined macaroons and blossoms. I do love those coconut kisses at Easter, so what better way then to combine 2 cookie ideas! You are the best at smash ups, girl!!! Um yes please. Those look just fantastic. I love macaroons, especially when they involve chocolate too! I just made these and they’re adorable! I ran out of kisses, so I put some holiday M&Ms on the rest! yumm!! thanks for the recipe!! Do you use waxed paper, as written, or parchment paper? Won’t the wax melt in the oven? Parchment! I’ll fix that, thanks for letting me know. Or a silpat works too! Think I’ll try putting the scoops of dough into mini muffin tins and then pressing the kiss or chocolate stars into them. Can these macaroons be made ahead? 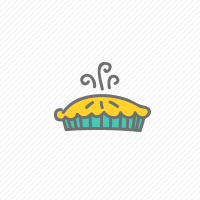 I’m doing early baking, well couple of weeks. How best to make ahead? Do they freeze well?